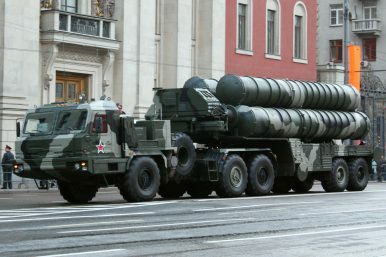 Russian state-owned arms maker Almaz-Antey has delivered a new S-400 Triumf advanced Air Defense System (NATO reporting name: SA-21 Growler) regiment to the Russian armed forces ahead of schedule, the company said in an August 27 press statement. “Almaz-Antey Group has delivered a new regiment set of S-400 Triumf surface-to-air missile systems to the Defense Ministry of Russia ahead of schedule. The official ceremony was held at the Kapustin Yar training range in the Astrakhan Region,” the statement reads without naming a specific date. A S-400 regiment is divided up into two battalions (also called divisions in the Russian military), which in turn are split into two batteries. A battery can consist of up to 12 transporter erector launchers (TELs), although 4 to 8 TELs per unit are more common. In addition to the TELs, each battery includes a long-range surveillance radar, target acquisition and engagement (fire control) radar systems and a command post, as well [depending on the unit composition] as an additional fire control radar system. Almaz-Antey, during this month’s 2018 Army Forum, an annual event organized by the Russian Ministry of Defense to showcase Russian-made military hardware, for the first time released official figures of the export variant of the 40N6. According to the information provided at the event, the 40N6E, with a maximum altitude of 30 kilometers, is not capable of exo-atmospheric interception of intermediate-range ballistic missile warheads in their terminal phase or satellites.